I first heard about The Twenty-One Balloons , by William Pene du Bois from Amy at Hope is in the Word who mentioned that her girls were eager to listen to this audio book but then were scared by the volcano in the story. She mentioned that it was the winner of a Newberry Medal in 1948 and I figured it sounded like a fun adventure story to tuck away and read with our boys when they are older. Almost immediately after she talked about it, I came across a copy and picked it up. Flipping through the illustrations, Bookworm1 noticed that there was a shark in the story and expressed an interest in reading it together. I obliged and we started reading The Twenty-One Balloons together. However, I ended up finishing it alone. The vocabulary was just too far above his head at this time and I could tell he was having a difficult time connecting to the story. I didn't want to ruin his impression of the story and so suggested we move on to something else at this time. As planned, I'll set it aside to read with our boys later because it is a fun (and intriguing) adventure story! Professor William Waterman Sherman decides to leave San Francisco in a hot-air balloon, travel across the Pacific Ocean and basically be alone for several years. He has grown weary of his teaching career and just wants to escape life and view the earth from above. 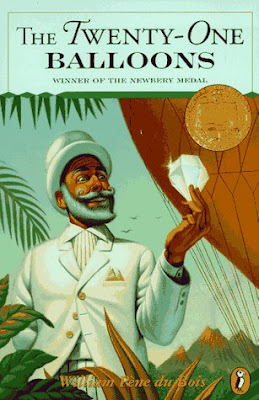 He builds an elaborate hot-air balloon and loads it with plenty of supplies for his extravagant journey. What he forgot to factor in though was menacing seagulls who might, just perhaps, pop his balloon. Professor Sherman ends up finding himself on a rather remarkable island that the rest of the world believes is uninhabitable due to a volcano which resides on the island and can potentially wreck quite a bit of havoc. Sherman is shocked to discover that there is a colony on this island, comprised of many families. They are housing a great secret among them and live a rather intriguing lifestyle. This book is actually open to being spoiled so I'm going to exercise a bit of caution and end my description of the book right there. Suffice it to say, I found this book to be a really fun adventure story for boys in particular. (Not saying that girls would be unable to enjoy this book, just saying it's a great one for the guys!) The Islanders have a rather unique worldview that can come across as rather legalistic and cult-like in certain respects, making this an interesting adult read as well. Apparently du Bois' publisher noted a resemblance between this story and a a story by F. Scott Fitzgerald entitled "A Diamond as Big as the Ritz." Our author of The Twenty-One Balloons had to acknowledge a similarity between the two tales, but stated that it certainly was not intentional. Given the fact that Fitzgerald's book was intended to be more of a parable for adults and du Bois story was for children, some differences can be drawn between the two. I found that interesting, given the thought-process that The Twenty-One Balloons causes an adult reader to go through. I've not read Fitzgerald's story but now I'm definitely curious about it. Apart from the worldview which begs for discussion, to a younger reader this book would be all about imagination and the wonders of science. I'm very glad Amy mentioned this book and I'm glad to have found a copy for us to enjoy. I highly recommend it - although perhaps to ages 8 and up, just to make sure that they can properly understand and enjoy the story more fully. I wonder if my girls would like it now? Hmmmm. . .
i read that book several years ago and enjoyed it too. i wrote a grown up book report for my blog. i will look up the fitzgerald story. thanks for reminding me about this fun read. Fascinating! I can definitely identify with Professor William Waterman Sherman--although it seems hot air ballooning might not be the best approach for escape. I just might have to read this book. Thanks! Never heard of this book, but now I totally have to check it out. Thanks for the review!